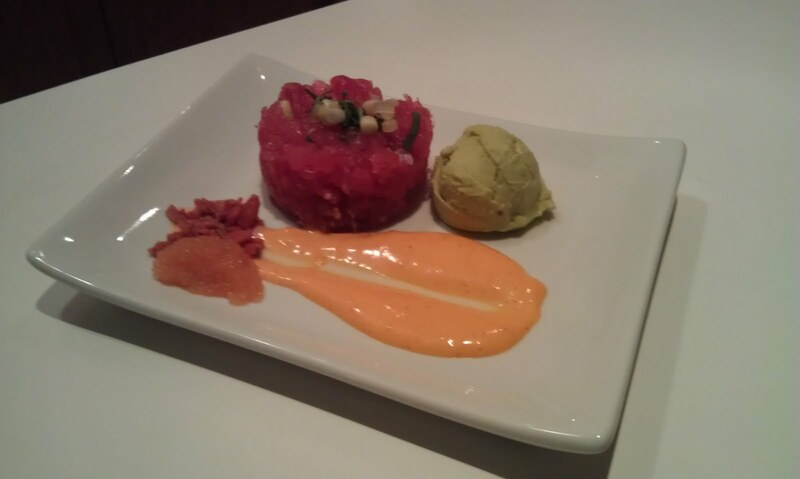 This one was really Ray's creation, although we collaborated on the details, the plating is really the star here. We were trying to recreate an appetizer we have had several times at a local restaurant. One of the ingredients required was bottarga, which we couldn't find, so we substituted in the smoked salmon, roe and ponzu. It was really meant to give a salty component to the dish. And the idea here is to get one perfect bite, of each of the components on the plate. So, this may seem a bit complicated, but it is impressive when it's all done. Slice avocados in half, remove pits and scoop out flesh into a blender or food processor. Add remaining ingredients and blend until smooth. Pour into an ice cream maker immediately, and freeze according to instructions. Place in freezer and freeze until firm. Combine these two. We aren't completely sure on the quantity of sriracha, because we "tweaked" along the way, and how spicy you would want this will depend on your palate. This is a very important component to the dish, however, so when you are tasting, if you think it is correct, add just a little extra sriracha and it should be perfect when you serve. Soak the salmon in the ponzu sauce for aa hour before you are ready to plate. Make a "swish" across the plate of the sriracha mayonnaise. Then, using a ring mold, press the tuna tartare into the mold firmly, and gently remove the mold. Take the avocado ice cream from the freezer, and make a small quenelle, and gently place on the plate. 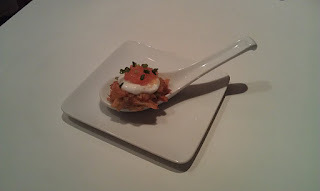 Make a small nest of the smoked salmon, and place a spoonful of the roe beside it. Top the tuna with the basil and scallions. Use the picture above as a reference, or be creative with your own plating. This will go against everything I say about quick and simple, because this process is neither quick nor simple, but we wanted a nice pasta dish as one of the components of our feast. And this does make a big batch, so you either have a meal for 6, or some you can freeze for later. You can also use the filling for a seafood lasagna, which can simplify the process considerably. So basic homemade pasta is egg and flour. We usually start with 2 eggs and one cup of flour, and add flour until the dough is quite stiff. It is difficult to describe the proper stage, it is drier than pie dough. I had a hard time learning this, but Ray has been doing it for years. The best teacher here is experience, as it won't roll smoothly through the pasta machine if you have it either too wet or too dry. Then place your dough in the refrigerator until you are ready to assemble your ravioli. In separate batches, saute the seafood in garlic and olive oil, and place them all in a bowl. Add ricotta cheese, lemon juice and spices and stir together. Then, roll out pasta and place small spoonful of filling for each ravioli. Depending on how you are cutting, cut and seal each individual ravioli and place on a parchment paper lined baking sheet. Start a pot of water boiling, and when it gets to a rolling boil, add ravioli. Cook only a few minutes, until they start to float, them gently remove from water with a slotted spoon. Saute garlic in butter until very soft. Add lemon juice and reduce to about half. 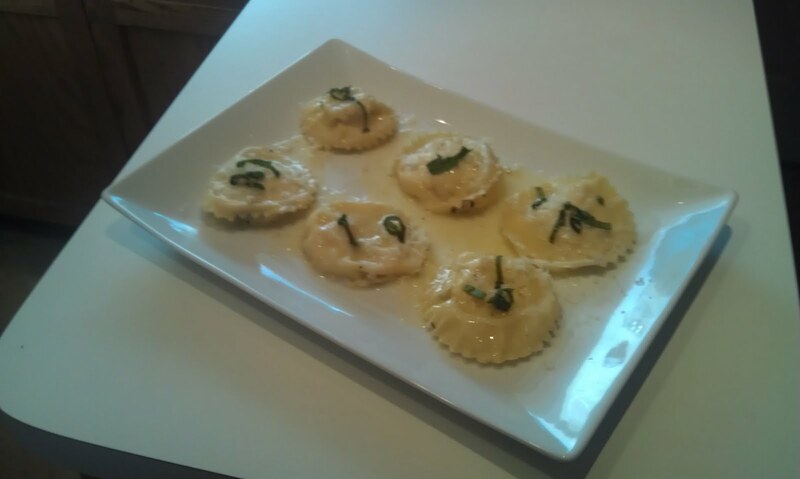 Sppon sauce over ravioli, and top with fresh basil. So what is Louie dressing? I just remember that my aunt Betty used to order it every time she saw it on a menu. It apparently is a San Franscisco "ladies who lunch" tradition, and is served with shrimp or crab. We were looking for a salad component to add to our feast, so this came to mind. And then there is the asparagus. I found this remarkable small asparagus at the store. It was so tender and tiny, and I thought it would look so cute on the plate. And it does ! This is a portion for two, but you could easily make this for several people. Quick and simple. Even simpler if you buy the shrimp already cleaned! Mix together the mayonnaise and sriracha, and stir in the other ingredients. Refrigerate. Prepare asparagus by trimming ends and cutting them all to the same length. Place in a microwave safe bowl where they can lay flat and add a little water. Steam for just 30 seconds, then place in ice water. In a saute pan, heat olive oil, and saute garlic until tender. Add shrimp and quickly saute just until they are pink and curl. Remove from heat. Dry asparagus, and arrange on plate. 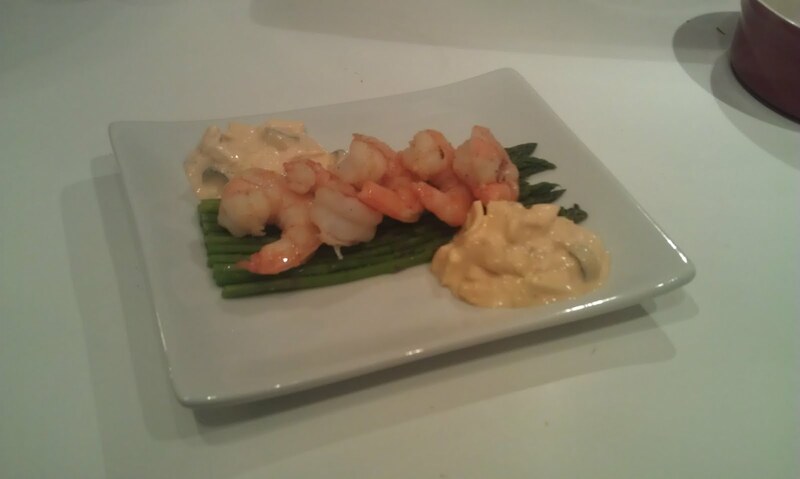 Top with shrimp and dressing. 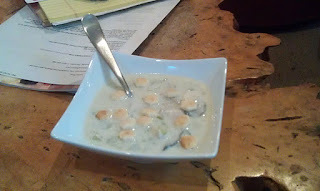 We always had oyster stew on Christmas Eve, before we went to church. I think it was just easier, and then we had the big dinner the next day. So this is my tradition's contribution to the Feast of Several Fishes. I don't know if my version is anything unique or special, but I like it because the vegetables stay just a little bit crispy, and it is rich and creamy. It is best to use small oysters for stew. In a large pot, melt butter, and saute onion and celery until they just start to soften. Add flour and stir to incorporate. Slowly add milk and stir to make sure there are no lumps. Simmer for 10 minutes, until soup thickens, then add oysters and simmer for 2-3 minutes just until oysters are cooked. Add tabasco, salt and pepper, and serve with crackers. We had some complicated dishes planned, so we wanted some simple ones as well. 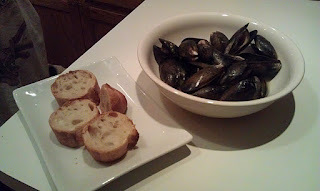 Mussels are really quick and easy to cook, and the cooking liquid is good with some crusty bread. The first time I had these was on my first trip to Ireland, where I was thankful to learn the trick to eating them: no utensils required ! The mussels open up while cooking, so you simply pull the shell apart, and use the top part of the shell to separate the meat of the mussel from the shell, and scoop it into your mouth ! Trying to use a fork or spoon is just an exercise in frustration. Get fresh mussels from your local seafood shop. Normally they will have cleaned them, but make sure all the "beards" are removed from the outsides. Rinse them, and remove any with open shells. In a large skillet, melt a stick of butter, and add 8-9 smashed cloves of garlic. Saute slowly until the garlic is lightly browned and soft. Add 1 cup of white wine and bring to a simmer. Add mussels, stir and put a lid on the skillet. Let them simmer on low 5-7 minutes until the mussels open up. Throw away any that don't open, as they are spoiled. While they are cooking, you can chop some fresh parsley for a garnish, and slice some crusty bread. Pour the mussels and the broth in a large bowl, and share. You can buy frozen mussels at the store, that are quite good, if you can't get fresh where you live. And we did that, at Christmas, to save time. And money, they were only $2.99 for a pound ! We wanted to start the feast with an amuse bouche-a small bite that is supposed to make you smile, and to stimulate your appetite. This dish was actually a bit of an afterthought. We had purchased this herring roe (caviar) for another dish, but we only needed a little bit, and didn't want to waste it, so I made this up to use some of the extra. This roe was very mild, so it was a perfect start to the feast. Mix together, refrigerate until you are ready to cook. In the meantime, heat a pan with 1 inch of vegetable oil to fry latkes. Remove from refrigerator, and scoop teaspoonful into hot oil. Fry to golden, press down and turn, then fry the other side. These only take a couple minutes on each side. Remove from oil and pat dry on paper towel. Cool to room temperature. To plate, place a latke on your serving plate, top with creme fraiche or sour cream, a small spoonful of caviar, and a few scallions. Very simple, but you can impress your guests ! It is an Italian holiday tradition to have the "Feast of Seven Fishes", which is a seven course seafood meal. We attempted this two years ago, only to find we can't eat a seven course meal (by we, I mean me, because I think Ray could). So, we celebrate the Feast of Several Fishes, and it more often that not, stretches over several days. I must be honest, this is not an inexpensive trip to the seafood store. It is a once a year treat for us. So, I will be posting several recipes that were the product of this years feast. I hope you enjoy them as much as we did. We were really exhausted after three full days of cooking and cleaning up after each course. 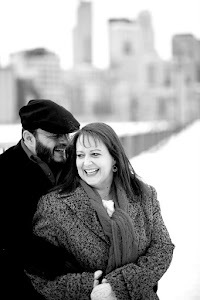 We did love it, but came away with a firm resolve that we. need. a. dishwasher. Well, other than the one named Ray. This was the first picture I ever posted on my blog. Let me say, I am not Italian, just by marriage. This is a very traditional Italian dessert that my husband requested me to make for him very early in our relationship. I love to bake; in fact, am not very humble about the fact that I consider myself an excellent baker. But, I was quite intimidated about making this dessert for him, because it had so many memories attached to it for him. So, the first time I made it, I probably didn't do as well as this time. I was thinking it had a pie crust, when it is really more like a cookie crust. So this time, I was smarter, and rolled the crust out only once, on plastic wrap and flipped it into the pie pan, and it was beautiful, tender and delicious. The recipe also calls for a lattice top, but I decided to cut out some festive Christmas trees for the top. Grease 10 inch deep dish pie pan. Combine the flour, sugar, baking powder and anise seed. Lightly beat the eggs, and add them to the flour mixture. Then add the butter, and mix to form a soft dough. Place on floured plastic wrap, and roll to 1/4 inch thickness. Gently place in pie pan, and trim edges. Flute edges, and chill remaining dough while you make the filling. Mix together filling ingredients in the order given. Put filling in the prepared crust. Roll out the remaining crust, and cut into decorative shapes, or make a lattice top. Make a glaze out of one egg yolk and a tablespoon of water, and lightly brush over the entire top of the pie. Bake for one hour until the filling is completely set. Chill completely before serving. We started a tradition a few years ago to have a Dutch Baby for breakfast on Christmas morning. The recipe has appeared in my blog before, but I will repeat it here, because it is so easy and good. A Dutch Baby is basically a baked pancake. It is traditionally topped with fruit and whipped cream. Since we loved the cranberry relish we had for Thansgiving so much, I made more, and topped the Dutch Baby with that, and some freshly whipped cream. 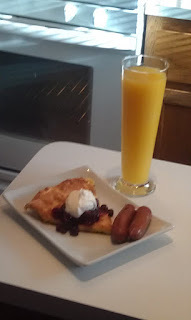 We had maple smoked sausage and a mimosa, and it was a festive start to our holiday! Preheat oven to 425 degrees and place a large ovenproof skillet in the oven. Put eggs in blender or mix with immersion blender for 1 minute. Gradually add milk, then slowly add flour, and blend for 30 seconds. Remove pan from oven, melt butter in pan and add nutmeg to butter. Add batter to the pan, and place in the oven. Bake 20 t0 25 minutes until puffy and lightly browned. It is a very dramatic presentation to pull the Dutch Baby out of the oven, it is very light and puffy, and slide it onto the pan. Sprinkle with fresh lemon juice and dust it lightly with powdered sugar. 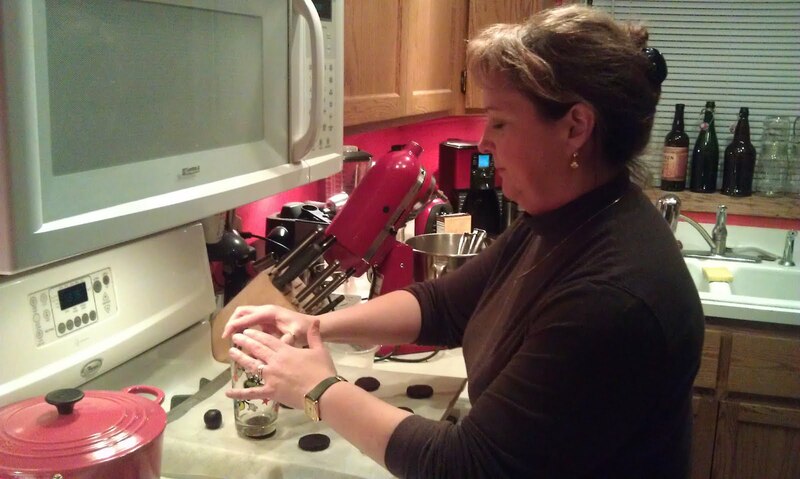 Several years ago, we started having a bake off as part of our Christmas party at work. It is one of my favorite parts of the party (of course)! One of my coworkers brought these delicious little cookies to the party. Neither he nor I won that year, but I came home with this recipe. I have made some modifications to the original. The instructions say to make the cookies in a long line, and slice them after baking. I have done it that way, but we like them better as you see them below. It also calls for a glaze, which I will include in the recipe. I didn't glaze them this year, it adds an additional level of sweetness, but they are perfectly delicate and buttery without it. And less sweet, which is OK at Christmastime ! Cream butter and sugar together, then add flour and mix well. Add just enough water to make the dough hold together well. 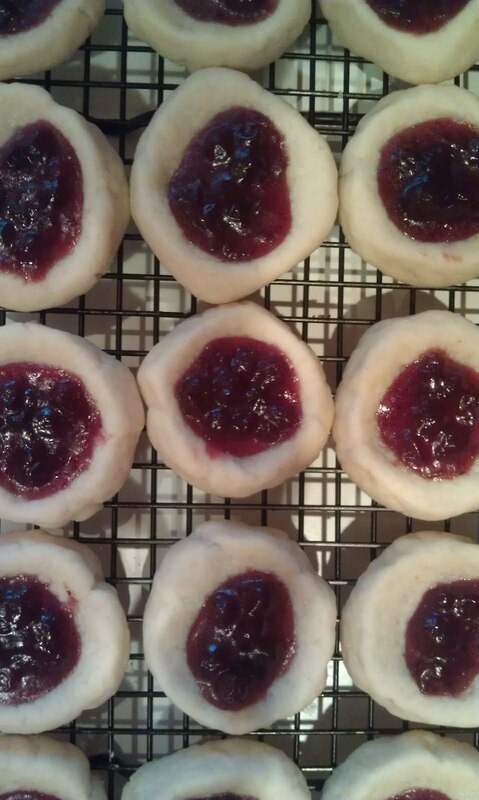 Form into small balls, make a small "well" in the middle of each cookie and add 1/2 teaspoon of jam. Bake 10 minutes, just until the edges start to turn golden, do not overbake. Let cool completely. Mix together powdered sugar, almond, extract and water. Drizzle glaze over tops of cookies and let set before storing. 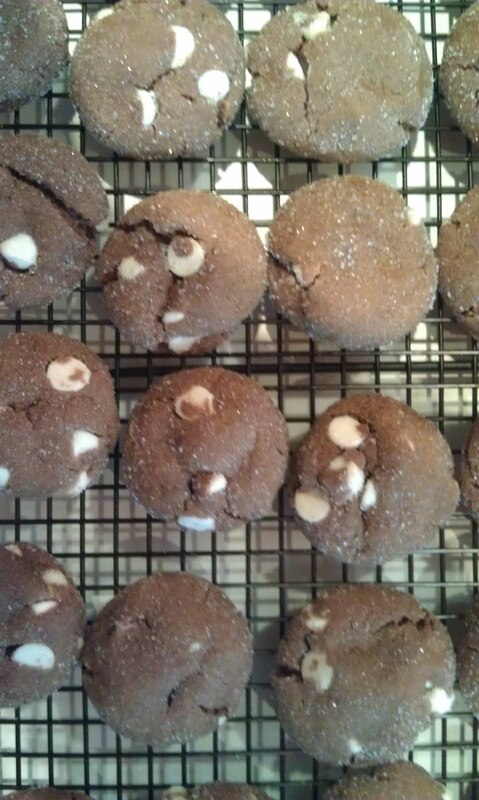 For many years, we baked molasses cookies for my Aunt Ruthie for Christmas. 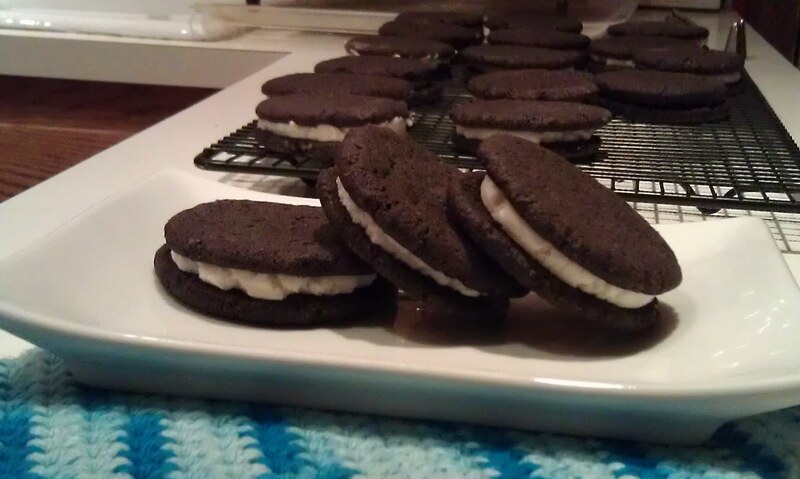 She always wanted them to be gigantic, and very dark and full of molasses flavor. I have to admit, I don't care for the flavor of molasses, and after making these for many years, I stopped when she passed away. My dad asked for some gingersnaps a few years ago, and I wanted to accomodate that request, but also make something I would enjoy eating. So, these are a nice compromise. They are soft, and spicy, and the white chocolate breaks up some of the intensity of the molasses. The secret ingredient is just a hint of chocolate. 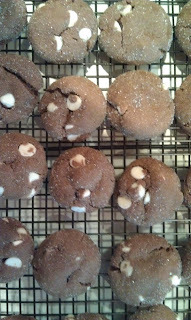 You could also make them without the white chocolate chips, and still have a ginger spice cookie that isn't quite so intense. Cream together butter and brown sugar. Add molasses and mix until well combined. In a separate bowl, combine all the dry ingredients together. In a small cup, mix together the soda with three teaspoons of boiling water. Beat half of the dry ingredients into the butter mixture. Add the soda mixture, then the remainder of the dry ingredients. Stir in the white chocolate chips. Roll the dough into 1 inch balls and roll them in the sugar. Bake at 350 for 10-12 minutes, until you see cracks form on the surface of the cookies. Cool on a rack. 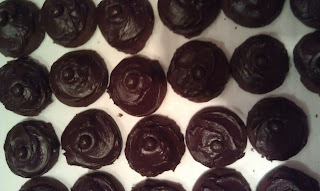 When I was small, my best friends mom used to make these soft, frosted chocolate cookies that I loved. My mom never made them, I wasn't really sure why, so they were always a really special treat. I found the recipe in a very old Better Homes and Gardens cookbook I purchased when I worked in an antique store. I have been making them for years as part of my annual Christmas cookie extravanganza. I decided I wanted to change it up a little, so , I invented this version because I loved the flavor of the Mexican mochas I get at the Farmers Market in the summer. I took this basic recipe and added some cinnamon, coffee and cayenne, and turned it into something really unique. Beat egg and sugar until light, then add vanilla and butter. Cream until smooth. Add melted chocolate, blend well. Add dry ingredients alternately with milk. The dough will not be as solid as a regular cookie dough. Drop by teaspoon onto greased cookie sheet and bake at 350 for 10-12 minutes. Let cool 1-2 to minutes on the cookie sheets then move to rack to complete cooling. Mix frosting ingredients together until smooth. Generously frost cookies, and top with a chocolate covered coffee bean. 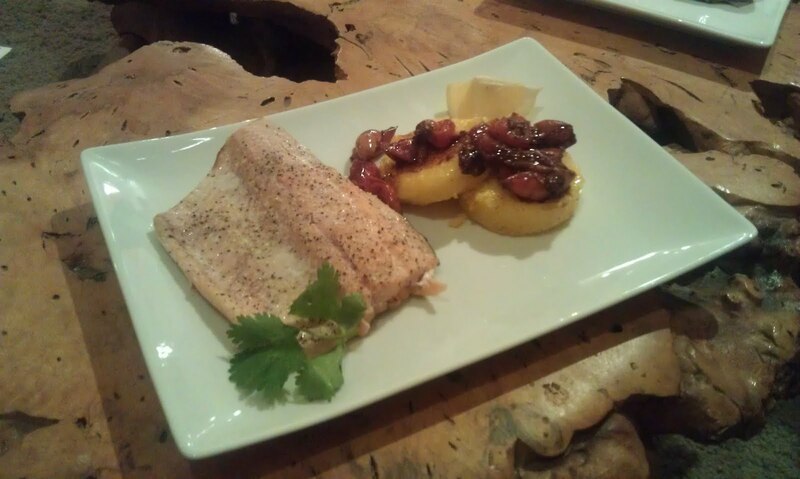 We received some amazing salmon filets from our new friends Jen and Jerry, and wanted to incorporate them into a dish. 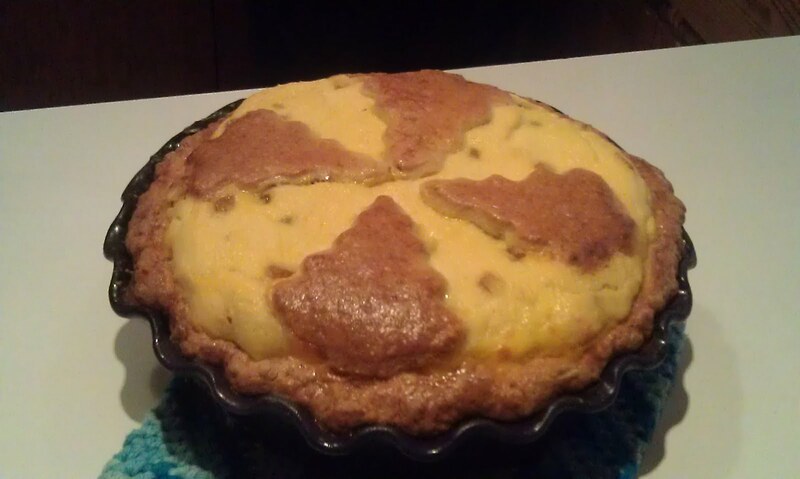 I had also wanted to try some polenta cakes, because I saw them on television, and had never made them at home. I have to admit, I purchased the polenta! I know, but I am not Italian! So, next time, you will see the recipe for homemade polenta, and the rest of the story. I did repeat part of a previous recipe and oven roasted some cherry tomatoes with balsamic vinegar, to use them up. It is a really simple thing to do, and they are so amazing ! Place these on a shallow baking dish, and bake for 30 minutes. Remove from oven. Increase heat to 450. Layer onions in the bottom of a shallow baking dish. Lay salmon on top, skin side down. Season wth salt and pepper and bake for 12 minutes. Remove from oven and let rest for 2-3 minutes. Serve with lemon wedges. I used a roll of purchased organic polenta from Trader Joe's, cut into 1/2 inch thick slices. Season with garlic powder, salt and pepper. Place a non-stick saute pan over medium heat and add approximately 2 tablespoons olive oil. When the oil is hot, place polenta cakes in pan, and sear 3 minutes on each side. To plate, place 2 slices of fried polenta on the plate, and spoon balsamic glazed tomatoes over the top. Place salmon along side. As I read this, it seems like a lot of work, but it really wasn't. The oven did most of the work, I just heated things up. 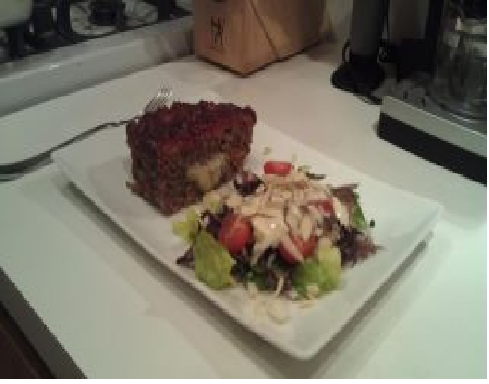 And as you can see by the picture, it was really good ! 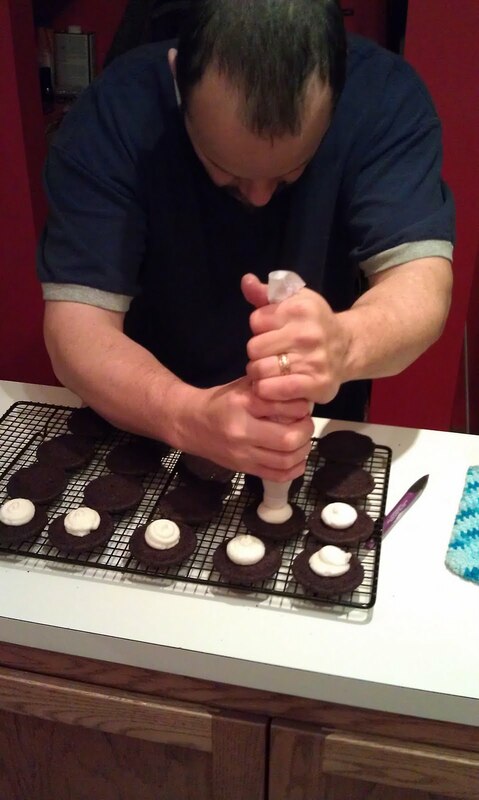 For years I have tried to recreate the taste and texture of an Oreo cookie. I always stopped at the cookie, I could never get the chocolate dark enough, or the cookie crisp enough (I settled on the idea that there would be no "Oreo" imprint on mine). Finally, I have it ! After much research, and suggestions from friends, here it is ! Preheat oven to 375. Line cookie sheets with parchment paper. In the bowl of an electric mixer, combine all the dry ingredients, including the sugar until well mixed. Leave mixer on low speed, and add butter, then egg. Mix until dough comes together in a ball. Place rounded spoonfuls of dough on the parchment line cookie sheets, about 2 inches apart. Flatten with the bottom of a glass. They may stick a bit, but this is the best way to get a consistent shape and thickness. Bake on the middle racks of the oven for approximately 9 minutes, then remove and let them rest on the pan for 2 minutes before removing to cool on a rack. Put a teaspoon "blob" in the middle of one of the cookies, and press another one on top. Squeeze to press the filling out to the edges of the cookie. These are going with me to the annual Bake Off at work tomorrow. Let's see how I do ! We are working our way through a wedding gift of Three Floyds beers, and making food pairings of each bottle. This month we had "Gorch Fock" which is a German style Helles lager. Since a lager is a very lightly flavored beer, I wanted a lightly flavored dinner to match it. This dinner was one I was very proud of, because I came up with it walking through the grocery store. I stopped at a seafood store to see what was they had for a "fresh catch". 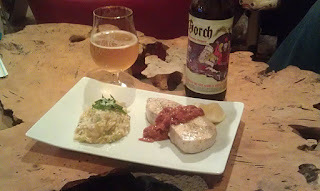 I picked up two nice Blue Marlin steaks, and then had to create a meal around them. My initial idea was a pasta, but since Ray is the pasta maker in the family, and I didn't want to make him work for his supper, that idea was out. So, risotto was my next logical choice. Risotto is a bit labor intensive, but the creamy texture is worth the effort. And, this meal required some timing coordination. The key was putting the steaks on the flame right at the last addition of stock to the risotto. Have 1 tablespoon butter and 1 tablespoon olive oil ready for cooking, and a saute pan that you can put in the oven. Toss tomatoes in vinegar, oil, salt and pepper. Bake at 350 for 1 hour until soft, then blend until smooth. Heat butter and olive oil in a large saute pan, and saute leeks and garlic until the leeks are tender. Add white wine, and stir until wine is almost evaporated. Heat chicken stock in a separate sauce pan, and add 1/2 cup at a time. Continuously stir until stock is absorbed, then add another 1/2 cup of stock. Continue in this way until the rice is tender, this will take 20-30 minutes. Just before adding the last portion of stock, turn on the heat for the fish pan, and add the butter and olive oil. Get the pan quite hot, and put fish in, sear for 2 minutes, turn fish over, and put in a 350 degree oven. To finish rice, turn off heat when all of the stock is absorbed, stir in parmesan cheese and sorrell. Then, remove fish from oven after 7 minutes and let rest for 2 minutes. Serve fish with tomato sauce over the top. To be honest, we haven't eaten anything all that interesting this week. After we put away all the turkey leftovers, I wanted anything that was exactly opposite of Thanksgiving food. So, I went back to an old standby, and made enchiladas. I did switch it up a bit and put chicken, corn and goat cheese in the filling, but they were just our basic enchiladas, so nothing exciting to post. Then I made a baked tilapia and baked butternut squash. Again, tasty, but nothing blog worthy. And now the confession. We almost NEVER buy store made canned sauces. But, when we were first trying to venture into Indian cooking, we were trying to find garam masala in the store, and Ray brought home a jar of Tikka Masala sauce from the ethnic food section of the grocery store. It had been sitting there for awhile, so I decided to try it. I wanted to compare how it tasted with the homemade we now have learned to make, which is excellent, but somewhat labor intensive. The answer is: not so good. It had the basic flavors of the homemade, but the intensity of spice and heat was not there, and it had a decidedly vinegar-y (is that a word?) taste that I didn't care for. It just reinforces my general opinion that it is better not to but the canned sauce, and stick to making my own. Tikka Masala will just have to be a rare treat because of the time involved in making it. Actually, the one occasional frozen meal we allow in the house is a frozen Indian dinner from Trader Joe's that has a better flavor than this jarred sauce, and was less work, so, lesson learned! We are going to grind some meat this weekend, so we can have meatloaf, and make some homemade Italian sausage. Stay tuned !